Dr. MacLeod Walls addresses students, faculty and staff in YGCU 221/222. A good portion of Jewell faculty, students and staff attended the Nov. 30 Town Hall during Jewell Time, eager to hear College officials’ level of preparedness regarding the Higher Learning Commission’s (HLC) accreditation evaluation set to take place Dec. 3-5. The HLC is visiting to review a sanction they placed on the College after a regularly scheduled annual visit when the Commission found that Jewell was using endowment funds to support operations at a rate that exceeded industry norms (five percent). After briefly opening the event, MacLeod Walls welcomed Vice-Chair of the College’s board of trustees Gary Barnes to speak. Barnes expressed his optimism about the HLC’s visit and relayed a request to the Jewell community. “We feel confident that there will be a successful result… In any interaction you might have with a visiting team, can you help them understand how special Jewell really is?” Barnes asked. MacLeod Walls supported Barnes’ request to the students, describing how they can interact with the HLC. MacLeod Walls followed with an outline of what the College has done to ensure it is in the best possible position both for external review and for the internal integrity of the institution. “We created a new mission statement [and a] strategic plan around that mission statement, and the board approved both of those. We established new value statements… that are reflective of the mission. We also have been on a parallel journey as an institution… We have worked especially hard as a community to rightsize our budget and to gain our financial strength,” MacLeod Walls said. MacLeod Walls announced that the College is in the strongest financial position its been in decades, pointing to several distinct initiatives made over the past year to get financial operations in optimal working order. Among these initiatives are the “painful but vital” removal of 3.5 million dollars from the operating budget, the sustained and continuous lowering of institutional debt, the growth of endowment value (over a 4:1 endowment to debt ratio), a strong financial responsibility score from the Department of Education (2.93 out of 3.00) and the Insider Investment Fund that has raised 12 million of the 25 million dollars raised thus far for the College’s 75 million dollar campaign goal. Repeatedly, MacLeod Walls emphasized her confidence in the College’s readiness and her optimism about the HLC’s visit. Opening the floor for questions from attendees, MacLeod Walls addressed faculty and student concerns about possible outcomes. 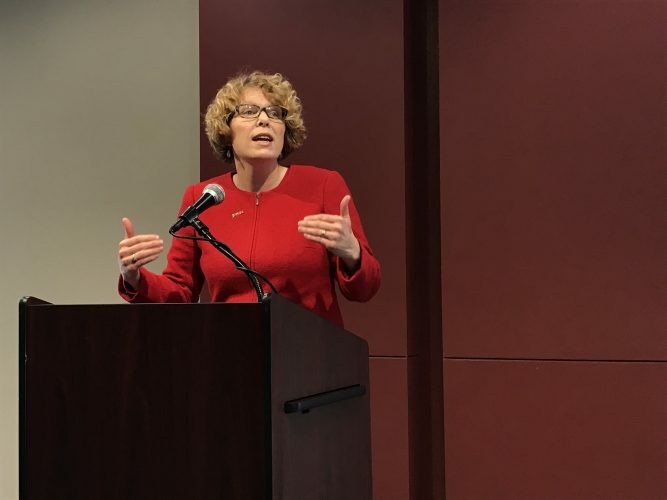 Most notably, MacLeod Walls again reinforced her confidence in the College’s preparedness, asserting that she believes the evaluation will conclude with the best possible result: continued accreditation for Jewell. Despite the negativity associated with the HLC’s visit, MacLeod Walls ensured the community of the College’s widespread support – including that of governmental officials like Senator Roy Blunt (R-Mo.) – and “unstoppable” growth in the face of this setback, and she concluded the Town Hall with an applause-drawing announcement. Conclusions from the visit will be made in mid-January, and final results should be available to the public by June. Cover photo by Savannah Hawley. *Correction: An earlier version of this article incorrectly stated that the Insider Investment Fund raised 25 million dollars out of a 75 million dollar goal. It should have said that 25 million dollars out of a 75 million dollar campaign goal had been raised, with 12 million dollars of the 25 million dollars being from the Insider Investment Fund.